In this letter from Editor-in-Cheif Ann Shoket (who writes a letter at the beginning to the reader in every issue, another think I love!) 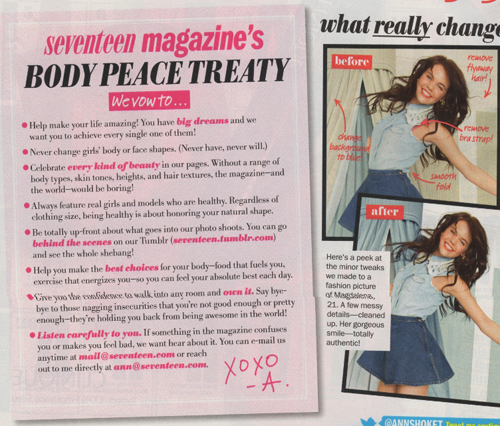 Seventeen now vows to “keep it real,” “Celebrate every kind of beauty,” feature “real girls” who are “healthy” which is about “honoring your natural shape,” as well as being “totally up front” about what goes on in their photo shoots and EVEN listening to their readers if they have any questions or concerns about this along the way. Not only is this a win for teen girls everywhere who treat this magazine as religiously as I did (and maybe still do…), but it’s also a huge win on Seventeen‘s part. Why? 1. It shows they listen to their reader. They could have ignored this petition, which garnered over 80,000 signatures. But they didn’t they turned something negative to a positive, and vowed to make a change for the betterment of the people who keep them in business — their readers! 2. They are promoting their social media along the way. Tumblr is taking over the teenage world right now, and the fact that Seventeen vows to be up front about what goes on in their photo shoots via this medium not only promotes their use of this site (which is phenomenal), but it also promotes interaction among their readers. And in this day in age, interaction is what brings someone from a customer, to a life-long investor (figuratively, of course.). 3. Publicity, baby! Sure, it sounds superficial, but PR News points out how big of a PR-win this was. Right now, Seventeen is getting so much publicity (aka free advertising!) for this move you almost wonder why it didn’t happen sooner. No doubt was some PR leverage put behind this to make it as big of news as it has become. And now, girls and moms everywhere are going to embrace this magazine even more than they ever have before because they not only promote real girls, but feature real girls sans Photoshop! As I said, I’ve totally in love with Seventeen, but setting my biased aside, this is a great move for any magazine — especially one targeting younger girls. One can only hope that more publications will take note and follow suit! So what do you think? Is this a great revelation in the world of magazines, or does it not make much of a different?